STS-135: One Last Time, With Feeling. The time has finally arrived, 30 years after the space shuttle Columbia blasted off into space her sister ship Atlantis roared into orbit just 2 days ago. It is estimated that near 1 million people flocked to the areas surrounding the Kennedy Space Center to watch the final ever launch with millions more tuning in from around the world to witness it online. I have to be honest and say that I missed the live event myself, blame goes to the sources that cited a 70% chance for no-go weather on the day, but I quickly caught up with the events spending hours pouring over the details of the last ever space shuttle mission over my morning coffee the day after. STS-135 is a very unique mission in many ways. It began as STS-335 a Launch on Need mission designed to be launched if STS-134 had any problems on orbit and was unable to return to earth safely. For such missions a fully stacked orbiter has to be ready to launch within a very short time frame, usually on the order of a couple months. This means the usual shuttle preparations have to already be done in order to launch that quickly and with the shuttle program retiring that meant there would be one fully loaded orbiter that would essentially go to waste. Last year saw the proposal to turn STS-335 into STS-135 approved although without any specific funding for the additional mission. 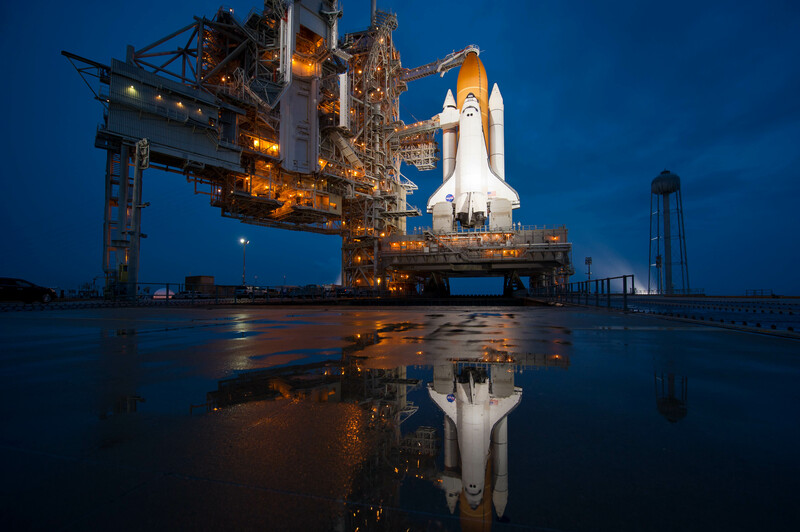 NASA announced in February that the mission would go ahead with funding approval or not, setting the stage for STS-135 to be the last shuttle mission in history. The final mission of the space shuttle also shares the record of taking up the smallest crew with one of Challenger’s early missions STS-6, bringing only 4 astronauts into space. The reason for this is simple, since there are no other shuttles available to act as rescue boats should Atlantis not be able to return from orbit those stranded astronauts will have to come back down in the regular Soyuz missions. Whilst the International Space Station is quite capable of handling the extra load for a while it will still take almost a year just to ferry those 4 astronauts back down and many of the ISS contingency plans are based around having no more than 6 astronauts on the station at any one time (without additional craft docked). STS-135 then only brings the bare minimum crew required to complete the mission and all signs are pointing to them being able to return safely so far. The payload of this mission is focused solely on keeping the ISS functioning for the rest of its intended lifetime, another 9 years or so. Atlantis carries in its payload bay one multi-purpose logistics module (named Raffaello) load with 16 resupply racks, the maximum it can carry, with an additional lightweight multi-purpose carrier that will be used to return some failed components back to earth for analysis. The failed components in question are a pump module for the external thermal cooling system and a ammonia pump module, both of which have already been replaced in orbit. STS-135 also carriers with an additional piece of equipment for the ISS, a proof of concept device for on-orbit refueling of satellites. For the demonstration it will be attached to the Dextre robot and should it prove successful the technology could make its way into the commercial sector. There will also be 2 iPhone 4s and 2 Nexus S’s carried up to be used with the ISS’s SPHEREs, basically small satellites that reside inside the space station. It’s a historic time as this mission marks the beginning of the end to a 30 year endeavor that NASA has undertaken. It might not be the most glamorous end to the program, being basically a supply mission to keep the ISS going, but it’s an important one none the less ensuring that the gap between the shuttle’s retirement and the availability of other craft doesn’t impact on NASA’s goals in space. For youngsters like me it marks the end of the iconic craft that we grew up with and I know its going to be a long time before another one will be able to take its place. For that simple fact the shuttle will always have a special place in my heart, just like I know it does in so many others.